This post was published on Isheeria's Healing Circles - https://isheeriashealingcircles.com/happy-gayatri/ as part of Ishieta Chopra's birthday Carnival. 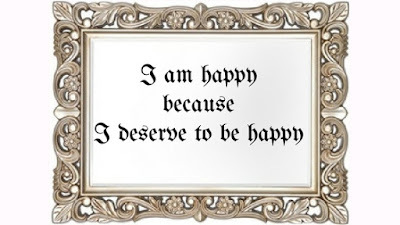 Before I wear my philosopher’s hat or start giving any tips, let me hit the nail on its head – Yes I deserve to be happy because I believe that I deserve to be happy. 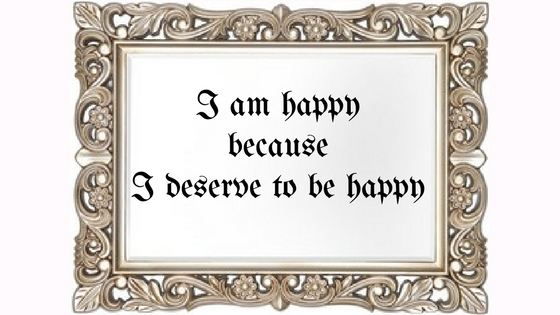 In fact, every person who believes that he/she deserves to be happy, deserves to be happy. Sounds confusing? It’s not. When I was asked this question, the first image that popped into my mind was that of my friend settled in US. During a trip to US, Shekhar - a friend of mine and his wife - Vrushali took me out for dinner. They had been in US for over 3 years. Although I was meeting Vrushali for the first time, we connected instantly. Both of them entertained me with their struggles and experiences of coming to US for the first time and the challenges they faced while adjusting to the environment there. Towards the end of our dinner, Vrushali looked in Shekhar’s eyes with a large grin and concluded “All said and done, now we are very well settled here. We deserve it! We have worked really hard for it”. Somehow her words and the twinkle in her eyes have stuck with me all these years. To be happy one has to believe that he/she deserves to be happy. Because that belief keeps us fighting all the battles and finding solutions for problems in life till happiness is found or is at least visible in the near future. The moment we lose that belief, it is half the battle lost already. Nobody’s life is perfect. We all have our own shares of ups and downs. But people who keep fighting the battle and look for solutions turn out to be the winners. Those who think that they are destined to suffer, to pay off the karmic debts or for any other reasons, will stop all the efforts to find happiness and will make peace with their sufferings. I have had my own phases of sufferings and I know that it is easier said than done, to continue believing that you deserve to be happy when life hits you hard in the face. So the only mantra I follow is “Keep swimming”. No matter how strong the current is, no matter how energy draining it is to swim against it, but if I keep swimming then I will move at least an inch out of the mess I am in, if I stop swimming then I will never be able to exit it and in the end I will be engulfed by it all. Last week a dear friend told me that she decides every day to be happy and the idea really appealed to me. Happiness is a choice you make every day, every moment. She told me that even if her day starts badly or she has a hiccup in her agenda to be happy, she constantly keeps reminding herself about her resolution to be happy, and things work out better than they would have otherwise. So today, let’s make a resolution that we all will decide to be happy every day. 7) Pursue a hobby, any one, that will make you happy. Those small pearls of happiness shine even brighter during dark days. Some of the hobbies are meditative and some give you nothing but pure joy. 8) Most importantly believe that you deserve to be happy from the bottom of your heart! Share your tips on how you keep your chin up during a bad phase or in general to stay happy every day in the comments below.